• Not for large cooking jobs. The Artisan Mini is a powerful mixer with a compact design. Unless the 3.5 quart capacity is a deal-breaker for you, this should be one of the first models you consider, due to its lighter weight, compact design, and designer colors. 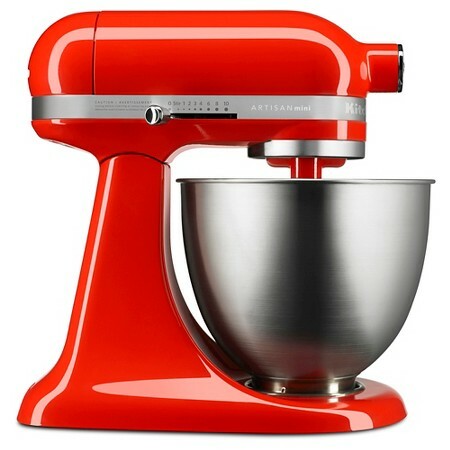 The Artisan Mini by KitchenAid is a mixer that is smaller and lighter than its regular-sized counterparts. Does it work? Read our Artisan Mini review. You can find the Artisan Mini in stores such as Target or Bed Bath & Beyond, or online at Amazon for about $330. KitchenAid has been a household name among kitchen appliances and tools for years, and one of the more recent offerings in their arsenal is the Artisan Mini Stand Mixer. Offering the same power as its Classic uncle, this 3.5-quart mixer takes up 20% less space while being 25% lighter. Despite its smaller size, you’ll still find all of the familiar features you’ve come to expect with an appliance in this category, such as a tilt-head design and 10-speed slide control. You can beat, whip, and cream just as you would with a larger model. The Soft Start feature begins mixing gently, and then works up to full speed, preventing splashing. There appears to be some question as to whether you can find a Flex Edge Beater for the Artisan Mini. When we contacted KitchenAid, we were told, “I am sorry, there is not a flex edge beater available for the mini mixer.” Yet at Sur La Table, it states that a Flex Edge Beater is included. This beater is not featured on other sites such as Target or Amazon. We’ll continue to research the availability of this particular attachment. It is safe not to assume that any existing attachments you have will work with the Artisan Mini. Mixing, beating, and whipping are all a breeze with the Mini’s powerful motor, and in some cases it almost seems to work faster due to the more compact size of the ingredients in the smaller bowl. You’ll also find the Mini to be one of the quieter mixers on the market. The smaller size also allows you to save counter space, and move the appliance around more easily. It can be stored in a smaller space, or placed up high without as much effort as the heavier standard model. There are 10 vibrant designer colors to choose from, which means you should have no problem finding a color to match your kitchen’s color scheme. The smaller 3.5 quart capacity should still be sufficient for all but the largest of baking projects, and we think it will be large enough for most everyday uses. Included accessories include a coated flat beater, coated dough hook, wire whip, and 3.5-quart brushed stainless steel bowl. KitchenAid has poised the Artisan Mini to become a regular member of the family, with an advertising campaign and a dedicated website. Overall, it’s a fine addition to the KitchenAid product line, and early consumer reviews reflect this, giving it a coveted 4+ star rating. If the compact size and weight are not of concern to you, the larger Artisan Tilt-Head Stand Mixer is offers all the muscle you’ll need for virtually any home baking job. That item holds an astonishing 4.7 star rating from over 6,500 consumers. It also costs less than the Artisan Mini. The Artisan Mini is an elegant space-saving mixer that can compete with the big boys on all but the largest of mixing jobs. If space is not an issue, you may want to opt for a larger, less expensive Artisan. If, however, you need the most mixing power you can squeeze into a small space, the Artisan Mini should be on your short list of options. Have you tried the Artisan Mini? Please give it a star rating and comment below.